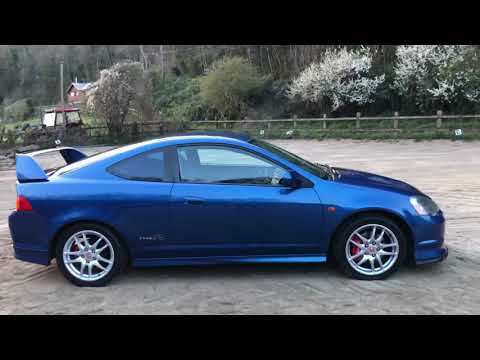 For sale is this excellent Honda Integra DC5 Type R presented in flawless Arctic Blue with matching Blue interior. This particular example was imported & UK registered in 2006. Upon arrival to the UK it passed all relevant IVA tests, was undersealed to prevent rust and a Toad CAT 1 alarm and immobiliser (Thatcham approved) was installed. A Japanese Export & BIMTA certificate are also present as evidence of the mileage. The odometer is still in its original Japanese form reading in KMPH. This is also the higher spec C pack with Push Button Start, HID Headlights and Privacy glass. Since 2006 the car has only had 2 previous owners, which is very low compared to your average DC5. It also has Full-Service History – the first owner attained a service book from Honda, which shows 5 stamps in total, with the remainder of the service history being supplied by specialists. The most recent service being around 2000 km’s (1200 miles) ago. There are also great stacks of invoices from the likes of Tegiwa Imports, Opie Oils, Demon Tweaks & Cox motor parts – the amount of paperwork is truly staggering. The body work is in good condition and shows no signs of rust. As previously mentioned on arrival into the UK the car was undersealed, in 2009 it was undersealed again to further prevent any rust formation. The paintwork is vibrant and full of colour, no fading at all. All Wheels have been refurbished and are wrapped in 4x Bridgestone Potenza RE070. All Brake Calipers have also been recently refurbished and are virtually untouched. The interior is to the same high standard. As part of our sales preparation the drivers bolster will be re-trimmed so there should be no common sag as usual. Interior photo’s will be uploaded as soon as the Recaro seats have been re-trimmed and fully valeted. Mechanically the car is sound. In terms of modifications it has a Tegiwa Carbon Intake, PasswordJDM Lip Kit and a custom exhaust which sounds great- not overly loud and along with the Tegiwa Intake makes the VTEC crossover much more noticeable. Photo’s of the engine bay will also be uploaded shortly. All in all, a very well presented 2003 Integra Type R. With only 2 Previous Owners and Full-Service History it’s clear to see its been cherished. Long MOT until November 2019 with a recent service less than 2,000 km’s ago. A full walk-around video is available, please just drop us a message and we will send it over. As mentioned above interior and engine bay photos will shortly be uploaded, if you would like them directly sent to you when they’re available just drop us a message.